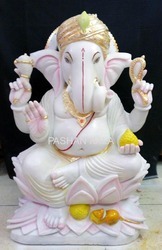 White Marble Ganesh Statue with four hand and stand and mouse. Good finishing work and beautiful picture. Made on marble work. Designed in accordance with client specifications. 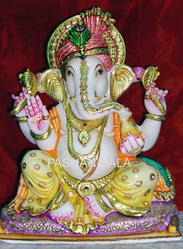 These Ganesh Statue can be kept anywhere which includes of buildings, homes to bring good luck and charm. 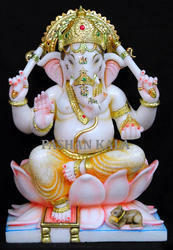 We are manufacture and exporter a comprehensive and aesthetically designed range of White Marble Ganesha Statue. The range of Marble Ganesh Ji rightly depicts the commitment, dedication and sentiment of the artisans. These product are precisely designed in order to provide a complete quality range. We are offering a wide range of these statue in different color combinations and size. 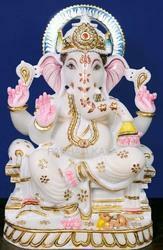 Our name is taken among the promising manufacturers and suppliers of Marble Ganesha Idols. 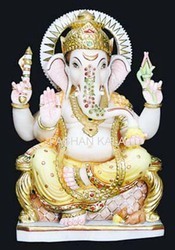 Designed in conformance with the international quality standards, Ganpati statues are known for their splendid beauty and realistic looks.These are quality checked under the guidance of our esteemed clients and offered with in stipulated period of time.These statues are highly praised by our clients for their long lasting shine and fine finish. Our name is taken among the promising manufacturers and suppliers of Lord Ganesha Idol. Designed in conformance with the international quality standards, Ganpati statues are known for their splendid beauty and realistic looks.These are quality checked under the guidance of our esteemed clients and offered with in stipulated period of time.These statues are highly praised by our clients for their long lasting shine and fine finish. Our designers have done outstanding work on these Stone Ganesha Statue reflecting different poses of Lord Ganesh. 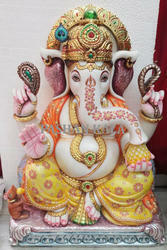 We offer these Ganpati Statues in varied shape and can customize as per the client specification. If you are looking for a company which has set benchmark in the manufacture and export of Marble Ganesh Statue, then our organization is the best choice. These statues are highly praised by our clients for their long lasting shine and fine finish. 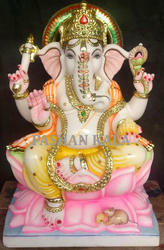 We are distinguished organization that is engaged in offering Decorative Ganesha Statue. These Ganpati Statues are carved beautifully and reflect the meticulous craftsmanship of our designers. Owing to rich experience, We manufacture and export quality oriented range of Ganesh Idols such as Lord Ganesha Statue, Decorative Ganpati Idols, Ganesha Statue and Stone Statue of Ganesha. The Marble Ganesha Statue offered by us with smooth edges and fine finishing are designed in different size, pattern and color. Designed in accordance with clients specification. We are offering a wide range of these Marble Ganesha God Statue in different color combinations and our client can avail these statue as per their requirement. Our team of artisan are widely engaged in designing Ganesha Moorti, Ganesh Statues using the finest marble procured from the reliable vendors of the market. 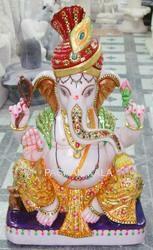 This idol of Ganesh God Statues is extensively used in Home as well as in many place, for decorative purposes. This idol is an excellent handiwork of creative mind that is highly appreciated by our customer. We are offering a wide range of these statue in different color combination and our client can avail these statues as per their requirement. This White Marble Lord Ganesha is in pure white spot free makrana marble with a very exclusive designs. Also, we can customize this statue in term of designs, sizes, colors and finish. 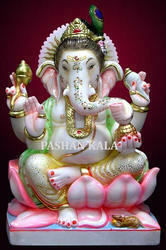 Moreover, these Ganesh Statue are ideal for use in office and home. We offer a quality range of finely detailed Marble Ganesha Moorti. These Ganesha are used for worshiping at home, temple and work place. Indian start their day with their offerings and prayer to Marble Ganpati Bappa for their success. We are offering them at combative price. Our product are manufactured in accordance with international standard. 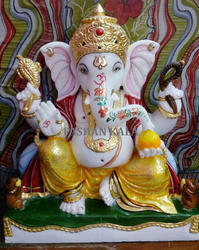 Our range of Marble Ganesh are one of the first choice of our client, owing to their scintillating colors. Offered in mesmerizing designs and patterns these statues are widely appreciated. One can avail these Ganesh in various sizes as per their specifications. These Ganesh Statues have been designed and crafted in very attractive and eye-catching patterns which attracts the attention of every person in the nearby area and hence are widely being used for worshiping as well as decoration purposes. 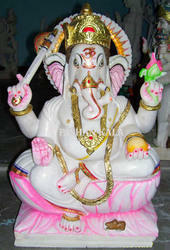 Ganesh Statues are also one of the most widely used and appreciated products of our company. These statues are highly praised by our clients for their long lasting shine and fine finish. 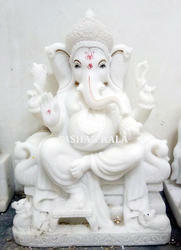 We offeran assortment of White Marble Ganesh Murti that is carved using qualitative marble. Our Marble Ganesh are available in varying size, luminous colour, and are polished to a glossy and reflective finish. We also customize our Ganesh as per client requirement. The beauty of the statue is highlighted with the fine detailing. The color are beautifully used. We make use of premium quality raw materials to furnish the Lord Ganesh Statue. 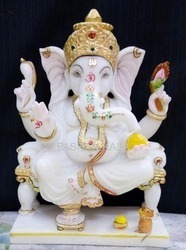 The White Marble Ganesha we offer are in huge demand during the Ganesh Chaturthi festival. These Ganesha Idols are carved out using premium quality white marble and are decorated with colorful and vivid paint showcasing the ornament and other accessories of the lord. 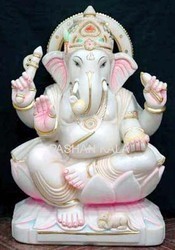 The Beautiful Ganesha Statue are presented in a sitting posture with four hands along with his vahana the mushak. This Marble Lord Ganesha Statue is in pure white spot free makrana marble with a very exclusive design. Also, we can customize this statue in term of designs, sizes, colors and finish. 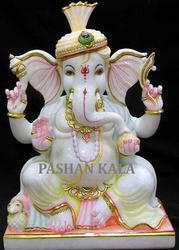 Also, we can customize this Ganesha Statue in term of designs, sizes, colors and finish. Clients can avail this statue at market leading price. 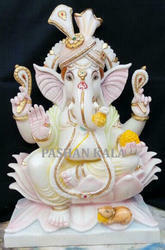 Marble Ganesh Sculpture is also available in various color, patterns, size etc . Which is specially designed by our artisans and expert and shape the moorti perfectly. Fine finishing and high quality of polish used in developing the moorti, which makes the moorti more lively and attractive. The moorti is best fitted for gift to relatives and friends on special occasion. Looking for Marble Ganesha Statue ?